[157 Pages Report] The data migration market size is expected to grow from USD 4.50 Billion in 2016 to USD 11.49 Billion by 2022, at a Compound Annual Growth Rate (CAGR) of 17.5% during the forecast period. The major growth drivers of the market include increasing business data volumes, evolving regulatory landscape, and need to maintain the legacy data. The base year considered for this report is 2016 and the market forecast period is 2017–2022. 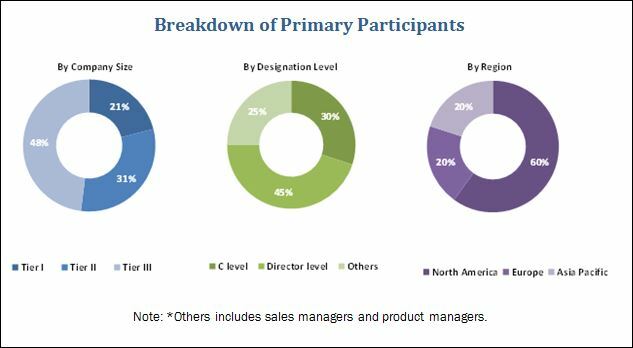 The main objective of the report is to define, describe, and forecast the global market on the basis of data types, business functions, components, deployment models, organization sizes, industry verticals, and regions. The report provides detailed information regarding the major factors influencing the growth of the data migration market (drivers, restraints, opportunities, and industry-specific challenges). The report aims to strategically analyze the micromarkets with respect to individual growth trends, prospects, and contributions to the total market. The report attempts to forecast the market size with respect to 5 main regions, namely, North America, Europe, Asia Pacific (APAC), Middle East and Africa (MEA), and Latin America. The report strategically profiles key players and comprehensively analyzes their core competencies. It also tracks and analyzes competitive developments, such as partnerships, collaborations, and agreements; mergers and acquisitions; new product launches and new product developments; and Research and Development (R&D) activities in the data migration market. The data migration ecosystem comprises vendors, such as IBM (US), Oracle (US), AWS (US), Microsoft (US), SAS Institute (US), SAP (Germany), Informatica (US), Information Builders (US), Talend (US), Attunity (US), Scribe Software (US), and Syncsort (US). The other stakeholders of the data migration market include data migration tool vendors, system integrators, cloud service providers, value-added resellers, data migration managed service providers, technology providers, and consultants/advisory firms. The data migration market is expected to grow from USD 5.14 Billion in 2017 to USD 11.49 Billion by 2022, at a Compound Annual Growth Rate (CAGR) of 17.5% during the forecast period. Factors such as increasing business data volumes, evolving regulatory landscape, and need to maintain the legacy data are expected to drive the growth of the global market. The report provides detailed insights into the global data migration market, which is segmented by data type, business function, component, deployment model, organization size, industry vertical, and region. Among data types, the customer data type is expected to continue to dominate the market during the forecast period with growing need to maintain customer data for improving bottom-line performance through better customer engagement. The financial data type segment is expected to grow at the fastest CAGR with the growing importance of migration process among banking and other financial institutions with the need for better management of data and ultimately, legacy systems. Among the business functions, the marketing segment is expected to dominate the data migration market as the implementation of data migration solutions is increasing to gain a 360-degree view of the data, which help them to design their marketing strategies in accordance with their target group. Human Resources (HR) business function is expected to witness the highest growth rate as HR personnel looks to consolidate the available data to initiate data analysis. In the component segment, the data migration software segment is expected to have the larger market share during the forecast period. The demand for data migration software is rising, as organizations need data migration to manage increasing data volume to enhance productivity and maintain business continuity. Among deployment models, the cloud deployment model is expected to witness the highest CAGR during the forecast period owing to its cost effectiveness, scalability, and ease of deployment. The large enterprises segment is expected to dominate the data migration market in terms of market share as these enterprises are keenly focusing on efficient data management to drive business growth. However, the Small and Medium-sized Enterprises (SMEs) segment is expected to exhibit a higher CAGR, owing to the easy availability and scalability of cloud-based deployments. The Banking, Financial Services, and Insurance (BFSI) industry vertical is expected to have the largest market size during the forecast period. This industry is exhibiting new growth opportunities coupled with rapid digital initiatives and stringent regulatory compliances. Additionally, it helps in cutting excessive costs while providing improved agility and scalability, overcoming the operational challenges. The retail and consumer goods vertical is expected to witness the highest CAGR during the forecast period owing to the need for consolidation of customer data generated across various touchpoints during customer life cycle. The report covers all the major aspects of the data migration market and provides an in-depth analysis across the regions of North America, Europe, Asia Pacific (APAC), Middle East and Africa (MEA), and Latin America. 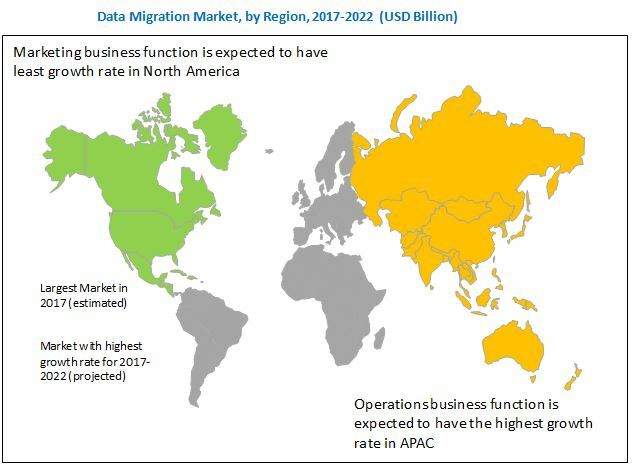 North America region dominates the global data migration market owing to direct presence of majority of data migration vendors. The APAC region is expected to grow at the highest CAGR during the forecast period, owing to the growing adoption of data migration software and services among SMEs with growing digitalization, and increased adoption of IoT-based technologies. However, increased data quality and address verification issues would restrain the market growth. Growing inclination toward cloud deployment and rising need for disaster recovery for business cointnuity would create lucrative market opportuntities. The global data migration market is fragmented in nature, as no single vendor dominates the market. Vendors that offer data migration software and services includes IBM (US), Oracle (US), AWS (US), Microsoft (US), SAS Institute (US), SAP (Germany), Informatica (US), Information Builders (US), Talend (US), Attunity (US), Scribe Software (US), and Syncsort (US). These vendors have adopted different types of organic and inorganic growth strategies, such as new product launches, partnerships and collaborations, expansions, and acquisitions, to expand their offerings in the data migration market. *Details on Overview, Products/Solutions/Services Offered, Recent Developments, SWOT Analysis, MnM View Might Not Be Captured in Case of Unlisted Companies.